Disclaimer: I receive free products to use in my recipes. All thoughts and opinions are my own. Edible cookie dough is like the new biggest thing. 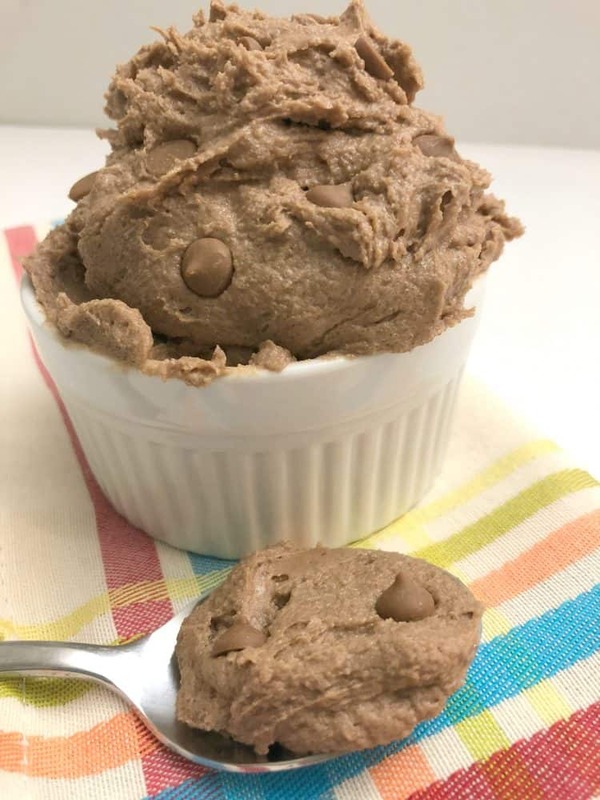 For years people have been sneaking hunks of traditionally prepared cookie dough, ignoring the warning that you’re not supposed to eat it, and now finally we don’t have to worry about that anymore. To be honest, I kinda feel like a part of my childhood has been destroyed. I mean, really, isn’t part of the fun in eating the cookie dough the fact that you’re not supposed to do it? Anyway, I needed to check out this version free of raw eggs and flour and see what everyone was getting all excited over. Seeing that this is part of Choctoberfest, chocolate was a given. But should I go classic with chocolate chip cookie dough? It was tempting, but then I received my items from Davis Chocolate and one small handful of their peanut butter chips had me quickly deciding that chocolate peanut butter was the flavor I needed to make. Those peanut butter chips are pretty cool. 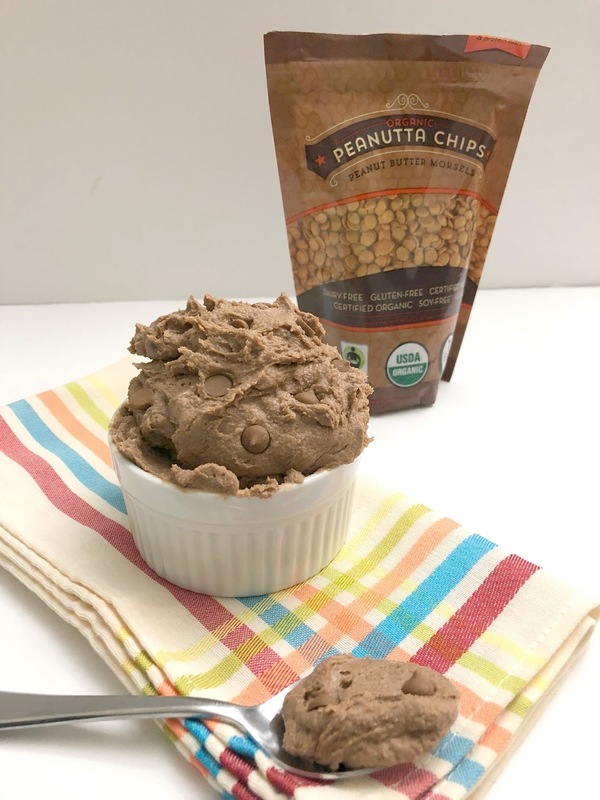 Not only are they the only organic peanut butter chips available, but they’re also soy and dairy free. As I’ve mentioned oh a thousand times or so, I’m lactose intolerant and while typically small amounts of dairy don’t bother me, sometimes when it’s combined with other ingredients (say, eggs and butter to make cookies), I end up feeling crappy. As I’ve also mentioned before, one of my coworker’s is vegan, and lately I’ve had a lot of fun trying out recipes for baked goods where dairy isn’t included or is substituted. 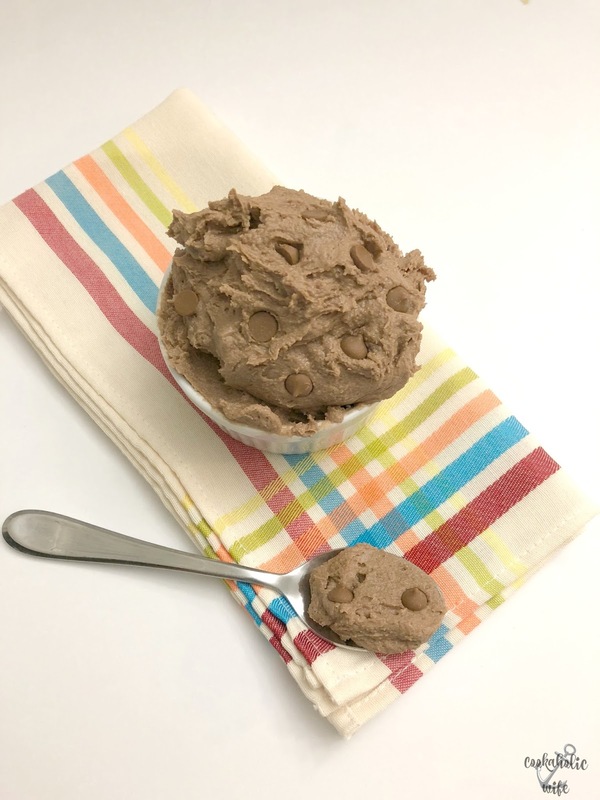 Edible chocolate peanut butter cookie dough is easy to make at home. 2. Spread flour out evenly on the parchment paper and bake for 5 minutes. 3. In the bowl of your stand mixer, add the butter and brown sugar and beat on medium speed until combined and creamy. Add the peanut butter, cocoa powder, vanilla and salt and mix until combined. 4. Slowly add in the cooked flour, mixing until combined then add in the peanut butter chips. If it isn’t obvious already, you NEED this in your life. Don’t forget to enter the giveaway! You can find it here, on Monday’s welcome post. Why is it that to try to win something you have to be on all different aspects of media? What happened to leaving just a comment? Not everyone has the time or space on their phone to do all this. Please respond to me bc I'm puzzled. Thanks for all the chocolate goodness on your blog! Those chips are amazing aren't they? Great idea making edible cookie dough! I DO need this in my life!! Hi J, I'm honestly not sure. Larger events and giveaways use widgets such as Rafflecopter and their standard options include various social media sites. I suppose it could have started with them or as a way to support bloggers that use certain social media over others. I know for larger events, its nearly impossible to track giveaways without a widget doing legwork. But, I do understand, I use my phone for a lot too and it's not great for opening different apps like it needs to for a giveaway. I hope you were at least able to get some entries in! Some let you leave a comment to get in an entry,unfortunately this one didn't. Thanks again for responding Nichole!